Since our color books are finished it is time to move on to our next skill. This would be shapes, with lots and lots of cutting practice. I started off this year with a square. I tend to go with circle first because most of the children already know circle, and we are doing snowmen which are made with circles. I changed it up this year because cutting skills are still evolving. I figured with a square we would cut straight lines, a lot easier than curves. First off, each child got a laminated square that I had made so that we could study them--also good for color review as the squares are different colors. We traced the sides to discover that a square has 4 sides. Then we examined the sides and "noticed" that all the sides are the same. We also drew big squares in the air with our fingers. We then used the squares to carry around the room to find other squares--very helpful that our whole floor is tiles. Finally, we took our little squares and put them together to make one big square. We counted the amount of small squares along each edge and saw that there were the same amount. I was pretty impressed when one little boy pointed out there were the same number diagonally too! We then went to the tables and cut out our red squares. We glued them to some paper with our square song. All of our shapes have a little song that go with them, it is to the tune of "London Bridge". just the same, just the same. 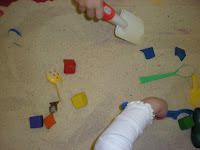 Another activity I did during free time was to place cubes in the sand table. I talked about how each side of the cube is shaped like a square.